Farfetch, a London-based luxury fashion website, has filed plans to list on the New York Stock Exchange. The loss-making fashion technology company, which connects brands including Chanel, Gucci and Balenciaga with wealthy young consumers, was started a decade ago by Portuguese entrepreneur Jose Neves. It secured $397m (£314m) from Chinese e-commerce giant JD.com last year, valuing Farfetch at more than $1bn. The firm, which promises to deliver Gucci products within 90 minutes, made a loss of $68.4m in the first six months of this year. Its revenue rose to £267.5m in the same period, from £172.6m a year ago. With luxury brands slow to develop their own online presence, Farfetch hopes to take a bigger slice of the $307bn global market for personal luxury goods. Online sales made up 9% of global revenue. 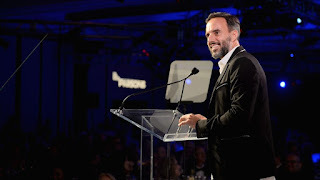 "This industry is still in its infancy," Farfetch founder Jose Neves said in the company's filing to the US Securities and Exchange Commission. It is also expanding its services in emerging markets as demand growth shifts from traditional markets, Europe and America, to China, Middle East and Latin America, and recently opened an Arabic language site in Dubai. While consumers have access to 3,200 different brands, luxury sellers can access Farfetch's 935,000 active users and, the firm says, a potential 2.3 billion people in 190 countries. The company did not disclose how many shares it plans to sell or the price of the stock.